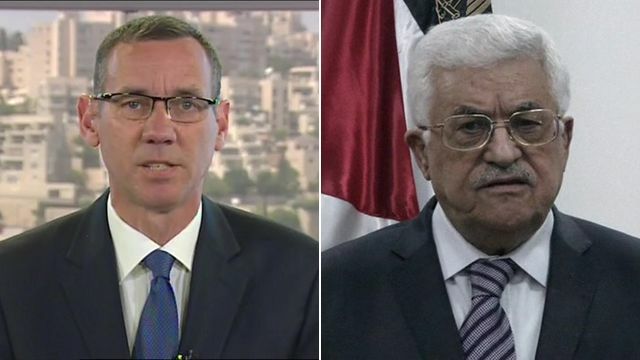 Reaction to West Bank toddler death Jump to media player The Palestinian president Mahmoud Abbas and Mark Regev, the spokesman for the Israeli prime minister, give their reaction to the death of a Palestinian toddler in an arson attack. Palestinian toddler dies in arson attack Jump to media player An 18-month-old Palestinian boy is killed in an arson attack by suspected Jewish settlers in the West Bank. Israel accused of 'war crimes' in Gaza Jump to media player Israel dismisses a report by Amnesty International which says there is "strong evidence" Israel committed war crimes in Gaza in 2014. Clashes at Jerusalem's al-Aqsa mosque Jump to media player Palestinian youths have clashed with Israeli police at the al-Aqsa complex in East Jerusalem, one of Islam's holiest sites. 'Alarm' at bus segregation plans Jump to media player Israel has suspended new rules that would have had the effect of separating Palestinian and Jewish passengers on buses travelling to the West Bank. Pedestrians hit by car in Israel attack Jump to media player The Israeli police have said that a driver - believed to be a Palestinian - has rammed his car into several people on a street in Jerusalem. Threat of war looming in Gaza Jump to media player There are growing fears that the war in the Gaza strip could start again. A funeral procession has been held for an eighteen-month old Palestinian boy who was killed in an arson attack on his family's house in the occupied West Bank. Israeli police say Jewish settlers are suspected of carrying out the attack on two Palestinian houses in the village of Duma. The Palestinian president Mahmoud Abbas described it as "a war crime" and "a crime against humanity". Mark Regev, who is a spokesman for the Israeli prime minister, said the Israeli authorities had officially designated the attack "a terrorist crime" and would bring those responsible to justice as quickly as possible.